Energy efficiency has become the highest priority for everyone involved in construction or building—from those at the highest level of government to construction professionals working at the ground level—because it can alleviate major issues by lessening environmental impact, saving money, and optimizing performance. A popular and effective route to increased efficiency is building commissioning. According to the Washington State University Extension Energy Program and the Northwest Energy Efficiency Alliance, “a building that is not commissioned will cost 8 to 20% more to operate than a commissioned building.”1 In addition, the payback of commissioning can be relatively quick. On average, the cost of performing commissioning is paid back in fewer than 5 years from energy savings alone.2 With the other benefits of commissioning—fewer project delays, requests for information, and construction call backs; increased equipment life; fewer maintenance problems; and better operator training—total cost of building ownership can go down and the entire cost of commissioning the building may be offset, resulting in an immediate payback. The following article, excerpted in part from a report entitled “A Guide to Building Commissioning” produced by the Department of Energy’s Building Technologies Program, explores what building commissioning is and how it can save energy, improve a building’s efficiency, lower building expenses, and give a quick return on investment. Commissioning is the process of verifying that a building’s HVAC and lighting systems perform correctly, efficiently, and according to the design intent and owner’s project requirements (OPR). The commissioning process for new construction integrates the traditionally separate functions of design, construction, and operation by bringing the project team together during each phase of a project. Existing building commissioning investigates, analyzes, and optimizes the performance of existing building systems by identifying and implementing measures to improve their performance. Without commissioning, system and equipment problems can result in higher than necessary utility bills, unexpected and costly equipment repairs, and poor indoor environmental quality that can result in tenant complaints and turnover. The tangible benefits are why commissioning is a requirement for buildings pursuing the popular Leadership in Energy and Environmental Design (LEED) certification, and why building codes are gradually adopting commissioning activities into code. Although commissioning focuses on the functionality of individual pieces of equipment, its primary focus is on the interfacing between equipment, components, and systems. It is easy to assume that energy savings can be estimated with simple, off-the-shelf methods and that promised energy savings will materialize from installing more efficient equipment; but this is not always true. As equipment, system design, and controls become more sophisticated, the likelihood of design errors and suboptimal operation greatly increases, confirming the importance of commissioning modern buildings and systems. Commissioning is a systematic process that includes design review, installation verification, proper system start-ups, functional performance tests, operations and maintenance (O&M) training, and complete documentation of the HVAC systems. It serves the building owner’s best interests by delivering a building with systems that perform per the OPR, project basis of design, and construction documents. There are 2 primary types of commissioning: new construction and existing building. While new construction commissioning focuses on ensuring new systems are fully integrated, tested, and functioning properly; existing building commissioning identifies deficiencies of existing systems and equipment, and makes recommendations to improve performance and ensure efficient operation. activities in the pre-design and design phases of the project. Engaging the Commissioning Agent in the pre-design phase can reduce design deficiencies and enable development of the necessary documentation before the design phase begins. As with new construction commissioning, major retrofit commissioning is a comprehensive approach to ensuring new equipment and systems are integrated and tested thoroughly when they are added to existing systems. It begins before the design phase and continues on past the acceptance phase of the project. Existing building commissioning includes recommissioning and retrocommissioning. Recommissioning refers to performing commissioning activities on an existing building that was once commissioned, either during construction or at some time after initial occupancy. The term “retrocommissioning” refers to performing commissioning on a building that has never been commissioned. Ongoing commissioning, continuous commissioning, and monitoring-based commissioning are additional terms that can more specifically describe activities falling under the umbrella of existing building commissioning. The process can return the building’s equipment to its original and intended operation. The need for this can be the result of years of accumulated deferred maintenance. Building commissioning can result in an update to the building’s systems to accommodate new tenants, renovations, or new building uses for which the building was not originally designed. It is common to repurpose a building without making the necessary changes to the building’s HVAC and lighting systems. Commissioning existing buildings can take a deeper look at building operations and find ways to optimize equipment and system performance. Construction cost savings result from fewer change orders and project delays. Identifying issues early during the design review process results in less post-occupancy corrective work and improved operation and reliability of equipment. Ongoing energy savings result from preventing suboptimal operating conditions for equipment and control sequences, and verifying proper equipment sizing. Non-energy and “intangible” benefits also result, such as improved project team communication, improved staff training, systems manuals, and complete O&M documentation. When commissioning starts during the pre-design phase of a new construction project, the result can be significant construction-related cost savings. Deficiencies identified during the design phase, rather than on the job site, are much less expensive to resolve. Also, early design review can avoid common problems like oversized equipment and incorrect or incomplete sequences of operation. These common issues can go unnoticed without the Commissioning Agent’s thorough review of the design documents and operational sequences. The commissioning process also employs effective communication strategies between all team members. Throughout the project, the commissioning team tracks and resolves issues by focusing attention on the issues at frequently held commissioning meetings. Improved communication throughout the design and construction process results in fewer change orders, claims, and project delays; shorter building turnover transition period; and less post-occupancy corrective work. Identifying design issues that may lead to inefficient system operation and wasted energy is one way commissioning can result in ongoing energy benefits. Prior to occupancy, functional testing helps resolve equipment problems and controls programming deficiencies that would lead to ongoing inefficient operation as well as increased maintenance costs. It is easy for the project team to focus on short construction timelines, trying to obtain the necessary permits for occupancy, potentially overlooking system operational deficiencies. These deficiencies can go undetected for years, negatively affecting building control, energy use, equipment reliability, and occupant comfort. Once a building is in service, building staff may not have the time or expertise to correct these persistent issues, or they may only be able to address the symptoms without fixing the real problem. Energy savings of new building commissioning can be significant. With proper commissioning, these savings can actually increase over time. In addition, when commissioning includes training and, in some cases, installation of permanent metering and feedback systems, improvements in system performance can persist for years after commissioning. This should reassure building owners that new construction commissioning can be very durable, and that outcomes will result in savings for the lifetime of the building. Finally, optimized system operation and right-sized equipment has the additional energy benefit of peak demand reductions in energy use. Utility companies pass along a charge to customers based on their peak energy demand, which is the maximum energy use of the building throughout the year. This typically occurs in the summer on the hottest day of the year, when a building is in full cooling mode. The charge is based on the infrastructure that must be in place to provide enough electricity to meet the peak demand requirement. System inefficiencies and oversized equipment can increase the amount of energy a building consumes, increasing its peak demand. A lower peak demand means a lower charge by the utility company. The cost of commissioning is different for each project and depends on the project’s size, complexity, and the scope of the commissioning process. There is no standard convention for determining which costs are included in the total cost of commissioning, but total costs typically include the Commissioning Agent’s fee, costs for other team members who participate in the commissioning process, and the anticipated cost of correcting problems identified during the process. Regardless of the commissioning scope, however, the cost of commissioning accounts for only a very small part of the overall construction budget. Commissioning a new building is a 5-step process that includes key activities in each phase of the project. 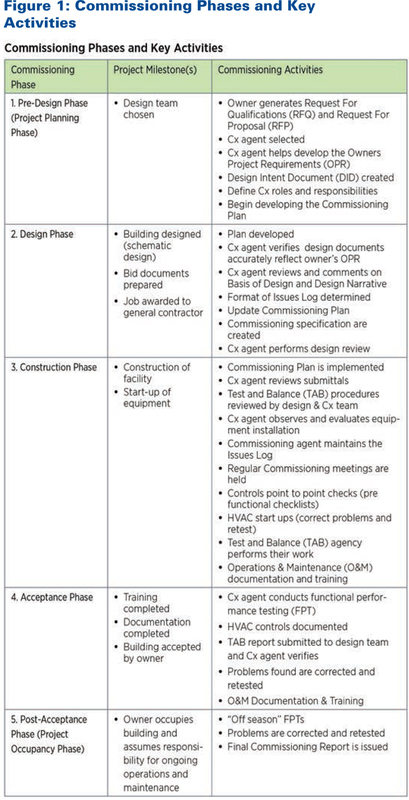 A description of the activities associated with each commissioning phase is shown in Figure 1. A more thorough, detailed explanation of the activities associated with each commissioning phase can be found in several documents referenced in the Department of Energy Building Technologies Program’s Guide to Building Commissioning, including ASHRAE Guideline 0–2005 and the ACG Commissioning Guideline. These are not the only deliverables to be expected from the Commissioning Agent, though. Other important deliverables include a thorough review of the OPR, design documents, submittal documents, and O&M manuals with comments provided to the team for consideration; commissioning progress reports; commissioning meeting minutes; systems manuals; O&M training verification; and a warranty review report. Commissioning is a team effort that requires effective communication, coordination, and cooperation between all of the parties involved with the project. The Commissioning Agent leads the team. Not all of the commissioning team members will be involved in each phase of the project. However, all should be fully engaged in the activities they are contractually required to perform. Commissioning Agent—Commissioning Agent, Commissioning Authority, and Commissioning Provider are used interchangeably to represent the person(s) who will be providing the commissioning services. Owner—The owner’s contribution to the commissioning process is vital to the success of every project. One of the owner’s primary responsibilities is to clearly communicate expectations about how the building should operate, as defined in the OPR. It is also imperative that commissioning specifications are included in the design documents and reviewed by the owner. Failure to do so will result in a change order for additional commissioning services. The owner needs to be a strong advocate of the commissioning process, motivating the entire team to actively participate by supporting both the Commissioning Agent’s responsibility to identify issues and the rest of the team’s responsibility to resolve them. Facility Manager and O&M Building Staff—The Facility Manager and O&M building staff are also important members of the commissioning team. Both can benefit if engaged in the commissioning process as early as possible. 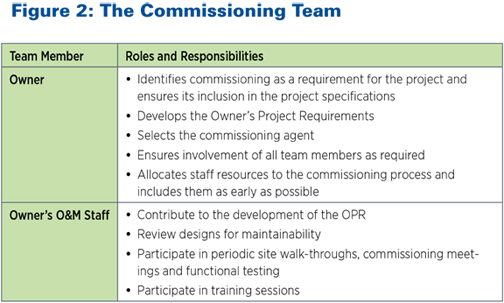 In pre-design, the Facility Manager should contribute to the development of the OPR. In the design phase, the Facility Manager can contribute to the design based on experience that can improve the staff’s ability to operate and maintain the building and equipment. Contributions may include modifications to control point naming conventions, graphic layouts of the energy management system, system choices, equipment layout, and other factors that affect maintainability. By participating in the commissioning process, building staff will gain an understanding of the building’s systems and their interactions well in advance of tenant turnover and occupancy. Observing functional tests and participating in training provided by the contractors and the Commissioning Agent will improve the staff’s understanding of equipment and control strategies. Building commissioning is a valuable tool that can and should be used to ensure buildings operate at maximum efficiency. Doing so can not only prevent significant future issues from developing, but can save a tremendous amount of energy and money by ensuring each aspect of the building is performing properly. Commissioning improves a building’s asset value. Properly functioning buildings with reliable equipment kept in good condition are worth more than uncommissioned buildings. Commissioned systems and equipment retain their value longer. There is a higher demand for comfortable, healthy, working space that promotes productivity. “Energy Efficiency Factsheet: Building Commissioning for New Buildings,” EnergyIdeas Clearinghouse, Washington State University Extension Energy Program and the Northwest Energy Efficiency Alliance, October, 2005. (http://cru.cahe.wsu.edu/CEPublications/wsueep98-018/wsueep98-018.pdf). “California Commissioning Guide: New Buildings,” California Commissioning Collaborative, 2006. (http://www.cacx.org/resources/documents/CA_Commissioning_Guide_New.pdf). Overton, David: “Building Commissioning 101.” Presentation Provided by the Building Commissioning Association (BCA). (http://www.aeesoc.org/pdfs2013/BCxA%20-Cx-101-20131113_nov_14.pdf). Mills, Evan, Ph.D., “Building Commissioning, A Golden Opportunity for Reducing Energy Costs and Greenhouse Gas Emissions,” Prepared for California Energy Commission Public Interest Energy Research (PIER), July 21, 2009. (http://cx.lbl.gov/documents/2009-assessment/LBNL-Cx-Cost-Benefit.pdf). Mills, Evan, “Commissioning: Capturing the Potential,” ASHRAE Journal, February 2011. (http://evanmills.lbl.gov/pubs/pdf/ashrae-commissioning-mills.pdf). “Commissioning for Better Buildings in Oregon,” Prepared by PECI for Oregon Office of Energy, March 1997. (http://www.oregon.gov/ENERGY/CONS/BUS/comm/docs/commintr.pdf?ga=t). U.S. General Accounting Office, Health, Education, and Human Services Division. Conditions of America’s Schools. Document# GAO/HEHS-95-61, Report B-259307; February 1995. (http://www.gao.gov/archive/1995/he95061.pdf). “California Commissioning Guide: New Buildings,” California Commissioning Collaborative, 2006. (http://www.cacx.org/resources/documents /CA_Commissioning_Guide_New.pdf). These excerpts were reprinted from “A Guide to Building Commissioning,” which was released by the Department of Energy’s Building Technologies Program. The report was prepared by Michael Baechler and John Farley, PE, LEED AP, CxA. The full text of the report can be found at www.pnnl.gov/main/publications/external/technical_reports/PNNL-21003.pdf.